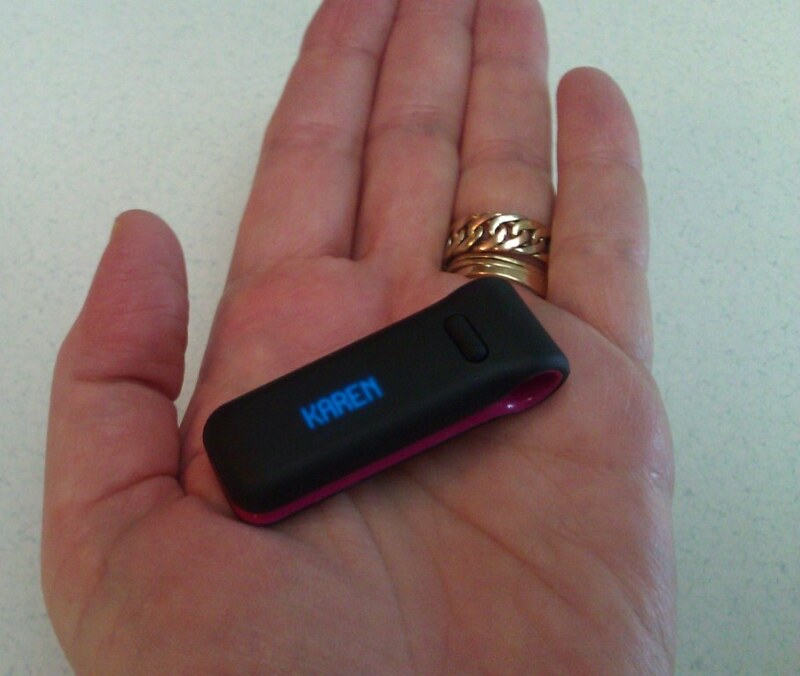 Fitbit Ultra is very small and lightweight. In April 2011, I made myself a promise to exercise at least 4 days a week. For the past 4 months, I have made a point of exercising nearly every day. Since February, I have also tracked my food using MyFitnessPal.com. This tool has helped me lose 15 pounds, since February 26, 2012, by tracking and planning my exercise and my meals. Every week, I set a new goal for myself by changing one thing. Just one thing. Sometimes it is a change in my diet. One week, I stopped drinking soda. Another week, I added a serving of vegetables or fruit to my daily diet. Other times it is a change in my activity, such as adding in a Pilates or Zumba workout. While MyFitnessPal helps me plan out my meals, my recent acquisition of a Fitbit Ultra Tracker shows me that I need to plan a way to increase my activity levels even more. The Fitbit is a pedometer that tracks your activities in real time. The device is compact and light-weight. It can even be programmed to greet you by name. The Fitbit easily clips on to your clothing or it can be inserted into a plastic holster, which can be clipped on to your clothing. The set also comes with a soft black band that can be wrapped around your wrist; you insert the Fitbit into a slot on the band. The companion website, Fitbit.com, gives the user all sorts of detailed information on daily activities: steps walked, flights of stairs climbed, calories burned and even information on how you sleep at night. You can also log your food items into the website. My Fitbit arrived last week and I have been faithfully wearing it for the past few days. While I do work out every day, for at least 45 minutes, I was shocked to learn how sedentary I am for a large part of my day. I was so sure that my high level workouts were the equivalent of getting 10,000 steps each day. 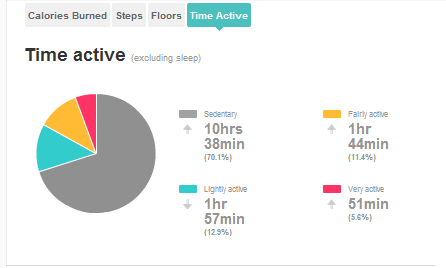 The Fitbit website provides a nice chart, showing your personal levels of activity hour by hour. This snazzy chart showed me that even with my daily workouts, I am not getting the recommended 10,000 steps a day! Since wearing the Fitbit, the most steps I have taken in one day is 8,000. Obviously, I need to get in a few more steps. This graphic shows my Time Active for 6-2-12. Too much gray!! Using the Fitbit, combined with MyFitnessPal, will help me plan my day, giving me a clearer snapshot of both my meals and my activities. I like that Fitbit will sync with other services you may already be using to track your health and fitness. Since I use MyFitnessPal.com to track my food and exercise, I can sync my Fitbit and MyFitnessPal accounts so whatever I enter at MyFitnessPal is automatically uploaded to my account at Fitbit. The activity information that is received from my Fitbit is also synced back to my account on MyFitnessPal. Using Fitbit, and all of the information it provides, will help me plan out my activities each day. My goal for this next week is to increase my daily steps, as well as making sure that I climb at least 10 flights of stairs every day. Here’s to losing the next 15! If you want to join me on MyFitnessPal.com, my user name there is Karen_ZH. The community of members there is quite supportive. The service is completely free.